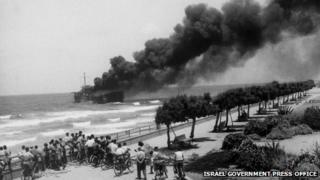 A project to raise a sunken ship in Israel, the Altalena, is stirring up painful memories of a violent confrontation between the army of the newborn state and the Irgun Jewish paramilitary group, reports PRI The World's Matthew Bell. Schoolchildren in Israel this year are studying two former prime ministers - David Ben-Gurion and Menachem Begin. Next year 2013 will be the 100th anniversary of Begin's birth, and 40 years since Ben Gurion's death. All these years later, Israeli authorities believe there is a great deal to learn from the two national icons. The truth is, Ben-Gurion and Begin did not like each other very much. Eventually, they reconciled. But in the first few weeks after the state of Israel was founded in 1948, these two leaders were on a dangerous collision course. The low-point came with the sinking of a cargo ship in June of that year. On the boardwalk in central Tel Aviv, across the street from McDonald's and next to a beachfront bar called Mike's Place, there is a stone memorial to 16 Jewish men. They were members of the Irgun militia, killed during the events leading up to the sinking of their ship, the Altalena. Just a month after the State of Israel declared independence, it was still fighting hostile Arab armies and the boat was bringing in badly-needed weapons. The commander of the Irgun at the time was Menachem Begin. The man who gave the order to attack the Altalena was David Ben-Gurion, Israel's first prime minister. He saw Begin's militia as a threat to the new Israeli government and was willing to spill Jewish blood to establish his authority. "People were very angry," says Shlomo Nakdimon, a retired Israeli journalist. Aged 12 years old at the time, he came to the beach to see the smouldering hulk of the Altalena with his own eyes. He remembers how he felt about the newly-founded Israel Defense Forces (IDF) killing Jewish militiamen of the Irgun. "I was angry like the other people," Mr Nakdimon says as he looks out to the Mediterranean Sea. Tel Aviv was a hotbed of support for the Irgun and people felt the new Israeli government could have resolved its dispute with the militia group, "without shooting, without Jews killing Jews." Jews killing Jews. That is what makes the Altalena affair such a painful one for Israelis. Yehiel Kadishai was one of a number of Irgun fighters among some 900 passengers on the cargo ship. Most onboard were Jewish refugees from Europe. He said the mood on the ship was one of indescribable joy. These were Jewish survivors of World War II, leaving Europe for an independent Jewish state. "I was very happy, together with all of us," Mr Kadishai says. "We were singing the anthem, the Hatikva." Mr Kadishai had grown up in Tel Aviv and served with Jewish volunteers in the British army during the war. He said he taught some of his fellow passengers Hebrew. There were political lectures and for those who had never held a rifle, lessons on the deck about how to shoot. When the Altalena dropped anchor north of Tel Aviv at a place called Kfar Vitkin, the refugees went ashore and were sent off on buses to begin their new lives. The Irgun men remained on the beach. Their job was to unload a huge stockpile of weapons from the Altalena. Menachem Begin was there and Mr Kadishai said he called for everyone's attention. "Begin started to speak and to say that there were some differences of opinion between the government and the Irgun," he recalls. "He said two or three sentences and all of a sudden, bullets came at us from two sides." In the confusion, Kadishai and the rest of the men on the beach took cover. Some grabbed weapons. Mr Kadishai started firing back, but he had no idea who - or where - he was firing at. Until the last day of my life, I'll be angry. "I was lying there. Next to me, one boy whom I knew from Italy was shot in his thigh and the blood was flowing from him. I couldn't move and I didn't know what to do," he says. The injured boy next to Kadishai eventually bled to death on the beach that night. Over the next day or so, the violence continued. Begin got back on the Altalena and it moved south, near the Tel Aviv beach. That is where the IDF shelled the ship and scored a direct hit. One of the Israeli commanders directing fire at the Irgun men was Yitzhak Rabin, who would later go on to become Israel's prime minister. When the shooting finally stopped, 16 Irgun men were dead along with three IDF troops. The ship was in flames, much of its cargo lost. Mr Kadishai says the idea that Irgun men would be shot at by members of the IDF was unthinkable. It is still difficult to talk about. "Now I can smile and laugh because 65 years [has] almost past," he says. "Until the last day of my life, I'll be angry." Yehiel Kadishai went on to become Begin's personal secretary. Director of the Begin Center in Jerusalem, Herzl Makov, believes it was Menachem Begin who pulled Israel back from the brink of civil war. "Begin decided not to fight back," Mr Makov says. "Begin realised it was a strategic issue: 'if we, the Jewish people were going to have among ourselves now a war, there was no chance to get independence.' So, he ordered, 'don't shoot back,'" he says. Mr Makov wants to highlight this lesson of history by raising the Altalena, or at least part of it, from the bottom of the sea and building a new monument. He is currently looking for funding for the project. But there is an enduring dispute over the ship. Not everyone sees Begin as the hero of the story. Some would say that Ben-Gurion's decision, as difficult as it might have been, to strike against the Irgun's weapons ship was a key moment for the Jewish state. The sinking of the Altalena, this line of thinking goes, is when Israel became a truly sovereign state. "Everything was still in the making, so in this situation the determination of Ben-Gurion was absolutely necessary," says Anita Shapira, a historian with the Israel Democracy Institute, who is working on a new biography of Ben-Gurion. "The idea that small minorities are entitled to use force to change the course of history was a basic tenet of all Jewish underground [movements]," Ms Shapira said. "Ben-Gurion wouldn't have any of it." The Altalena affair is burned into Israel's collective memory. People have continued to draw historical analogies to the incident. During negotiations between Israel and the Palestinians, there were calls for Palestinian leader Yasser Arafat to create his own "Altalena moment" by reining in militia groups by force. Then there are the comparisons with the Jewish settlements scattered across the West Bank. They are considered illegal under international law, although Israel disputes this. As with the Irgun militia, Jewish settlers are viewed by some Israelis and their supporters as the vanguard of the Zionist movement. Others see the settlement project as endangering Israel's future. In any case, Herzl Makov at the Begin Center says learning from history is important - and a lesson which raising the Altalena could provide. Listen to more on this storyat PRI's The World, a co-production of the BBC World Service, Public Radio International, and WGBH in Boston.